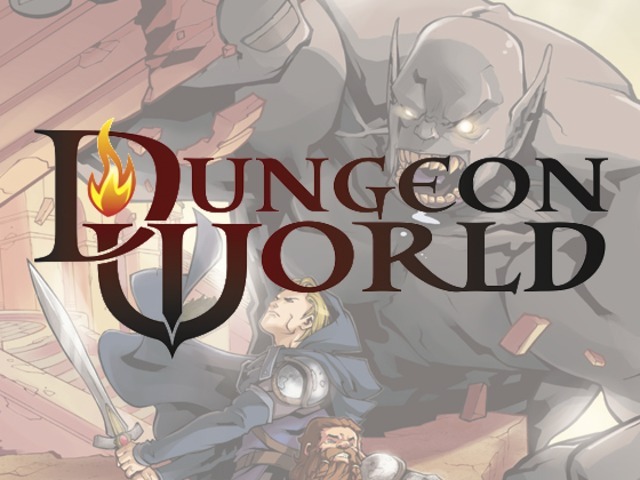 Last week I ran through my first “proper” session of Dungeon World, a roleplaying game that feels a lot like the classic Dungeons & Dragons adventures of my youth, with a thoroughly modern take on rules. 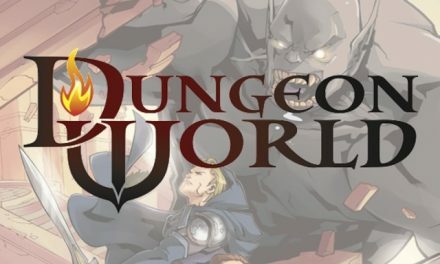 I backed Dungeon World on Kickstarter last year and ran a brief session with a couple of friends when i recieved the pre-publication PDF. We had a lot of fun and one of those friends, Rohan, recently asked if we could play again. I haven’t done much roleplaying lately, and have been keen to get back “on the wagon”, so this seemed like an excellent opportunity. 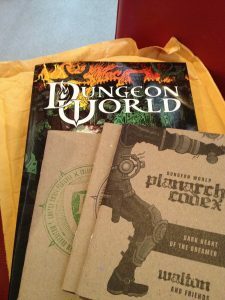 I received the book (and a few other goodies that I wasn’t expecting) earlier this year, so spent a week devouring the rules and getting up to speed on the game. Dungeon World is surprising simple and straightforward game – although the book is some 400 pages long, most of it is advice, examples, and monsters. The basic mechanic of the game is to talk together, describe an interesting situation, and if those descriptions trigger a “move” you roll dice. Moves are pre-defined activities, like fighting an enemy, casting a spell, or avoiding some danger through physical or mental prowess. There are a bunch of “basic” and “special” moves that every character can perform, then each character class has a number of unique moves, too. You roll 2d6 and add any appropriate modifiers. On a score of 10+ you do exactly what you wanted to do, no trouble. On a result of 7-9 you get what you want, but at some cost. On a score of 6 or less things go pair-shaped and the game master (GM) will make your life more difficult! 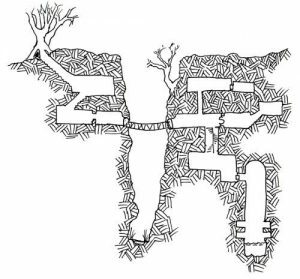 In preparation for games night I grabbed the excellent Goblin Gully map and adventure from Dyson’s Dodecahedron. I re-stocked the adventure a little bit, and noted the stats of the goblins and other creatures in preparation. This was probably a little more planning than Dungeon World advises, but I wanted to be “on the ball” with the first adventure, able to check the rules I would need in play well before we got there. You can get my version of the adventure here. Character creation took about 20 minutes all up, including my overview of the rules. Rohan created Rosira the Halfling Fighter, Brad became Tommy Tightlips the Thief, Michael created Willem the Bard and Jason became Carmine, Cleric of Centaris, a God of Civilisation. Each player introduced their character and I asked a few questions to find out more about them. This was excellent as it revealed some really interesting details about both the characters and the world. The holy symbol of Centaris is a noose that a cleric wears about his neck; Willem’s father was bard to the King before being (falsely) accused of treason, forcing the entire family into destitution; Tommy Tightlips was forced on the run after a heist in the city went terribly wrong. Players then filled out bonds – short statements that define a relationship with one or more characters. This fleshed out the world and their backstories even further. For instance, when it was revealed that Carmine the Cleric thought “Tommy has insulted my deity, I do not trust him” and Tommy “Stole something from Carmine”, we discovered that the Tommy’s disastrous heist involved a valuable relic of the Church of Centaris. We had a blast defining the relationships, though in hindsight, a number of them put characters in conflict with Tommy, which caused some problems later in the adventure. The adventure also ran smoothly, though I wont go into all the details here. They fought a horde of goblins, and everyone enjoyed feeling like real heroes, even in their first adventure, ploughing through a dungeon full of green critters. The room with the murder holes caused an interesting challenge that they eventually overcame by waiting for the goblins to run out of ammo. When Tommy discovered the large crystal in the hidden chamber he chose to hide it from the other characters, which did cause a fair bit of trouble between the characters which I am not sure was satisfactorily resolved. This is probably partly my fault, and I will be trying to sort it out in this evening session. Combining these facts with what we already know about the characters and the world, things are beginning to shape up quite interestingly. We are playing again tonight, though it might not be with all the characters as Jason cannot make it tonight. And I must say, I am really looking forward to it!